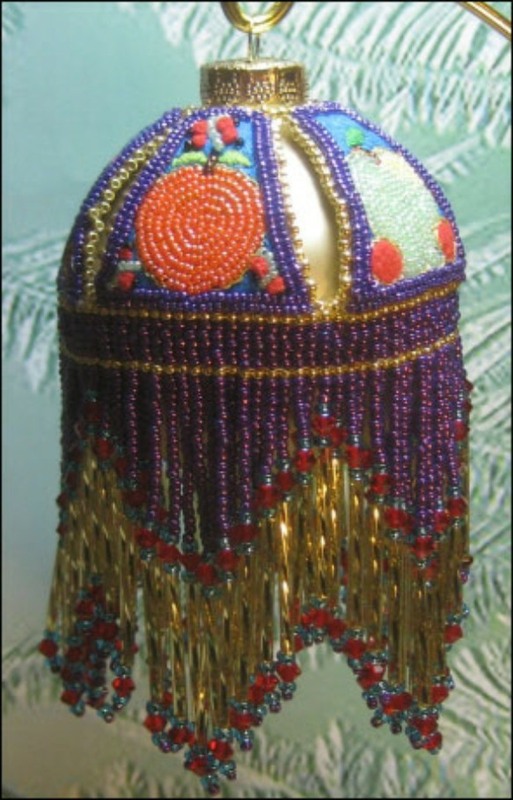 Della Robbia - This is a detailed, step-by-step instructional pattern for an originally designed beaded Christmas ornament cover in bead embroidery using 2-bead back stitch accented with floss embroidery for the 5 fruit panels. The panels include grapes with strawberries, a pear with a cherry, a plum with raspberries, an orange with currents and a Granny Smith apple with cherries. 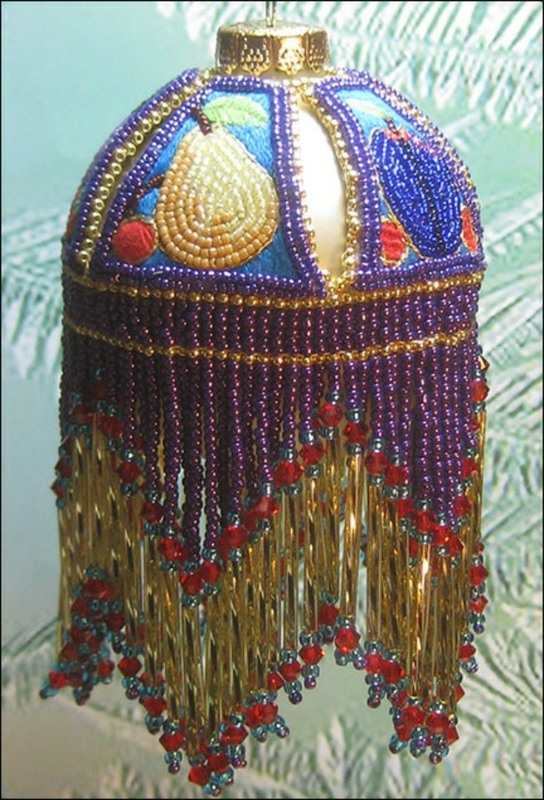 The fringe is accented with 4mm crystals (I used Swarovskis) and 25mm bugle beads. 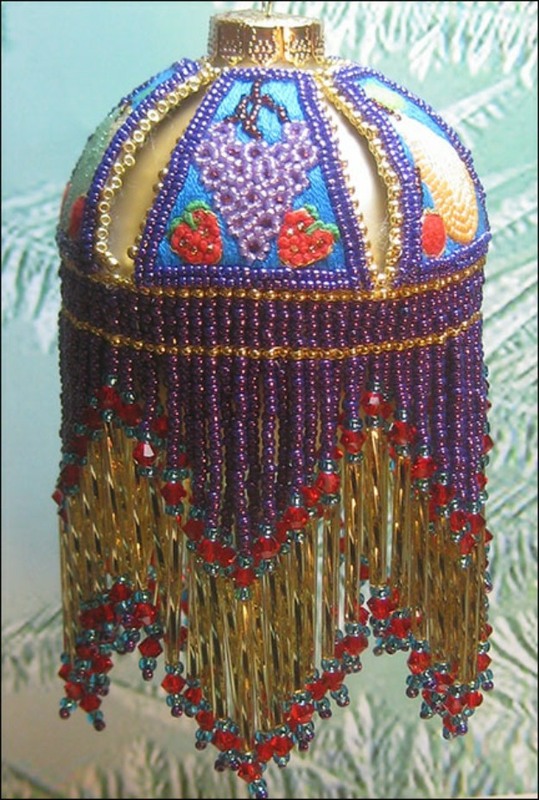 While the ornament is shown in purple with aqua accents it would also look wonderful in aqua with purple accents or other color combinations you might prefer. The instructional pattern has 12 pages to print and includes 20 photos and illustrations and a full page with 5 each, 25 total, of the panel designs. You will also require embroidery floss, 1 page of iron-on T-shirt transfer paper appropriate for your type of printer, stiffened felt. a small amount of fusible interfacing, hot fix crystals or 3mm round crystals, and beads (see list below).